Originally published on March 23, 2015 and updated July 9, 2015. • A list of the water management program team members. The team should consist of 10 or fewer key individuals who will oversee the program and make decisions about it. Many others will be needed to implement the program. • A brief description of the building water systems, with flow diagrams. Salient information should be included for all of the building water systems, not just the ones prone to Legionella growth and transmission. Simple line diagrams should show where water is received, processed, and used. For most facilities, at least two diagrams should be included, one for domestic (potable) water systems and another for utility (non-potable) systems. Flow diagrams should be simple. Resist the temptation to add valves, equipment, scaling and other unnecessary details that clutter the diagrams and ultimately hinder their real purpose. • Analysis of Building Water Systems. Commonly referred to as hazard analysis, this is a brief explanation as to why each water system does or does not present a significant potential for Legionella growth and transmission and, for those that do, whether it is a location at which Legionella control measures can be applied. • Control measures. This is the most important part of any Legionella water management plan because control measures are what actually reduce the risk of Legionnaires’ disease. If effective control measures are not selected, the Program will fail to sufficiently reduce Legionella risk. If ineffective or unnecessary measures are specified, the facility will waste time and money. The team must come up with a specific list of control measures for each building water system. 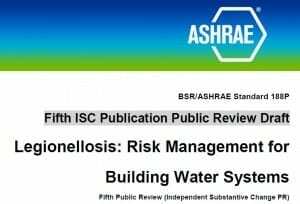 ANSI/ASHRAE 188 gives only a framework, stating that procedures must be included, as applicable, for new construction, equipment siting, start-up and shutdown, inspections, maintenance, cleaning, disinfection, monitoring (e.g., temperatures; disinfectant levels), and water treatment. The team must also write out steps for responding to Legionnaires’ disease should a case occur despite the prevention efforts. Each control measure must be monitored to determine whether it is performed to the standard—called a control limit—designated in the Program. If the control limit is not met, then corrective action must be implemented. The monitoring procedure, monitoring frequency, control limit, and corrective action must be listed for each control measure. • Verification procedures. These are procedures to ensure the Program is being implemented. • Validation. The effectiveness of the Program must be validated. Testing water systems for Legionella provides the most direct feedback on Legionella control. 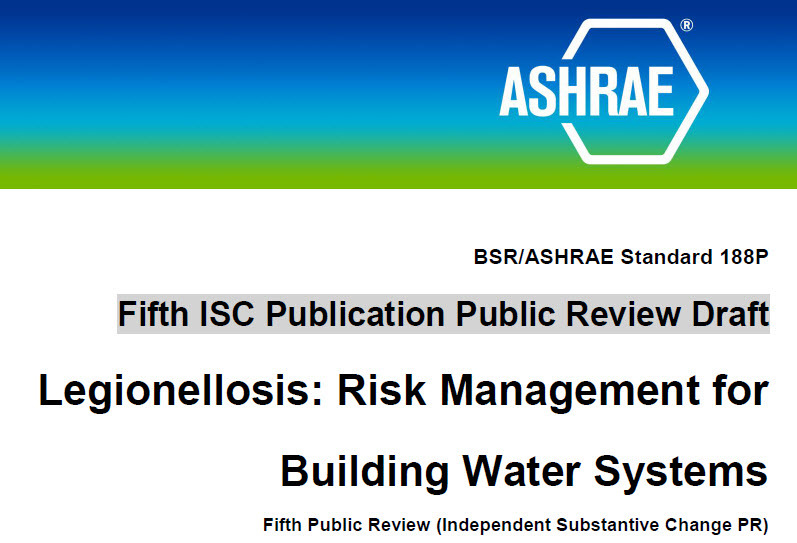 Legionella testing is discussed as a validation option in ANSI/ASHRAE Standard 188-2015 but is not required. For new construction or renovations, designers and contractors have responsibilities as well. Designers must provide documentation, diagrams, or instructions as needed for monitoring and control, code compliance, operation and maintenance, control system operation, calibration, installation and start-up, commissioning (including procedures for flushing and disinfection), filling and draining, equipment sizes, piping layout, system materials, pipe sizes, design flow rates, design temperatures, and the impact of heat loss or heat gain. Designers must also note locations of equipment access (or note inadequate access), filling and draining, flushing, sampling, temperature monitoring, treatment, no flow and low flow areas, possible cross connections between potable and non-potable systems, and outside air intakes. Proper balancing of plumbing systems must be documented in a report to the owner. Responsibility for balancing will begin with engineers, in specifying valves, and then pass to contractors for performing the work. ANSI/ASHRAE Standard 188-2015 is nothing to fear. For well-maintained buildings, Legionella control measures can be implemented and documented for a reasonable investment of time and money (see “How Much a Facility Really Pays for a Legionella Risk Management Program“). The investment could pay back several fold in protecting health and life as well as the facility’s assets, image, and revenue. So, if I read the above correctly, a public school, private school, a hospital that is less than 10 stories is not required to comply with !88? 2.2 This standard applies to human-occupied commercial, institutional, multiunit residential, and industrial buildings. Section 2.2 still applies. The only building type specifically excluded in 2.2 is a single-family residence. A water management program is needed for a building’s plumbing system if any (not all) of the factors apply. For example, any hospital with patients staying longer than 24 hours needs a program, regardless of the number of stories. An office building with fewer than ten stories needs a program if it has a centralized hot water system. My understanding is that “multiple housing units” describes a centralized hot water system rather than the type of building or occupants. Hotels/Motels with centralized hot water systems would qualify as “multiple housing units”, right?